Considering Apple's penchant for giving its devices names like iPhone, iOS, iPad and iMovie, you'd think the letter "i" would be inviolate for Apple: something to keep pure; to protect at all costs. 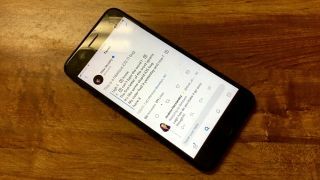 But no, millions of iPhone users recently found themselves plagued with a strange bug that replaced most standalone uses of the lowercase "i" with a pound sign and a box with a question mark. Today, fortunately, the madness ends with the iOS 11.1.1 patch, which "Fixes an issue with the keyboard auto-correct." The patch also fixes an issue in which some users (myself included) weren't able to activate the Siri voice assistant by calling out "Hey, Siri." Fortunately, it's not a huge patch, so you should hop on that if it's been giving you some trouble. Previously iPhone users had managed to kinda, sorta fix the bug using a text replacement command under the Keyboard section of General settings. All you had to do was set it so that all standalone cases of "i" – i.e., when you're referring to yourself – automatically converted to a capital I. Most of the time it worked, but sometimes it didn't. Sure, you could have just fixed it by using the Shift key to capitalize it every time, but where's the convenience in that? There was no discernible rhyme or reason to the bug. Sometimes I found the error would show up on published Facebook posts, but wouldn't register when I attempted to fix it by editing the post. Whatever. For now, at least, our brief personal nightmare is over. Having downloaded the patch, I can confirm that it appears to have solved both issues. Don't miss our iPhone X review!